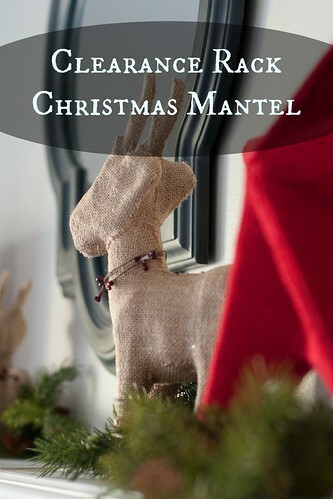 It may take a couple of years to accumulate all the details for the look you wish to achieve, but shopping sale racks and after season markdowns is a frugal way to develop a full Christmas mantel. 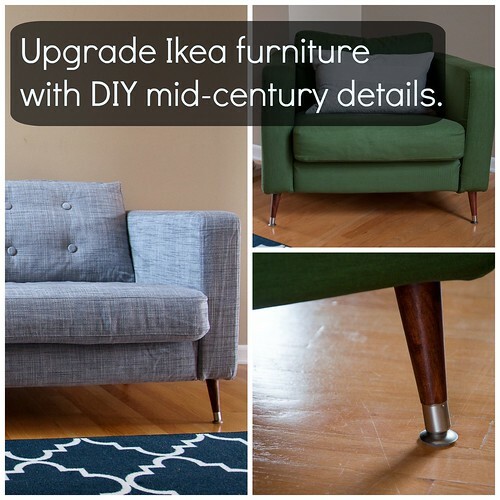 With a little time and labor, bland IKEA Karlsdad furniture can be transformed with mid-century details. We added tufting and legs to achieve the look! 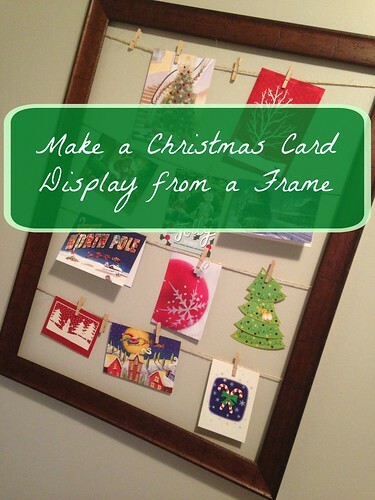 Creating a Christmas card display using a a large, empty frame is a super simple project! 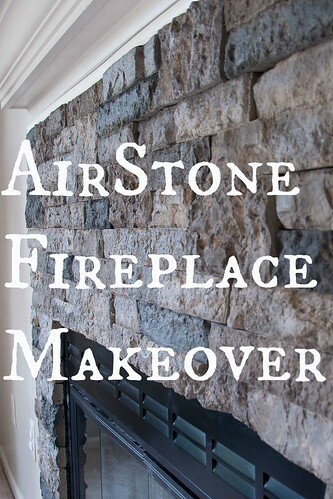 With the holidays on the way, Mike and I were thrilled earlier this month to receive materials from AirStone to help us make over our fireplace. Those samples (Spring Creek bricks and adhesive) were provided to us free of charge, but the opinions and information in this post are entirely our own. 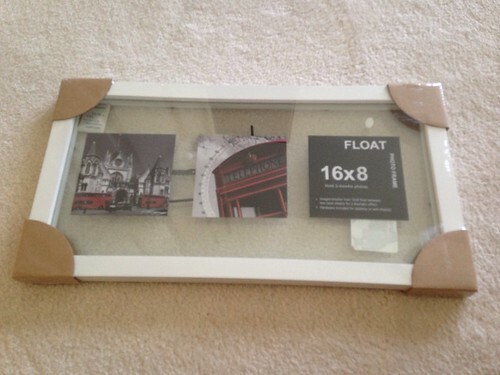 You can find more information on this product at airstone.com, including installation tips and videos. After Command hook after Command hook kept popping off the wall, we decided it was time for a more permanent solution for hanging dress-up clothes. 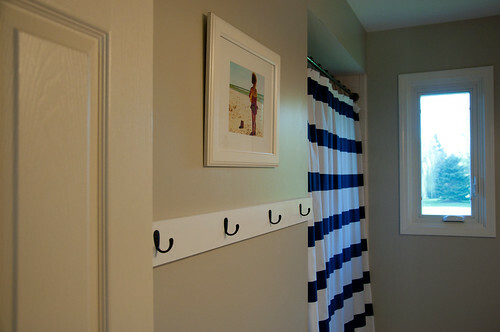 We created a DIY dress-up rack using mismatched hooks and scrap wood. 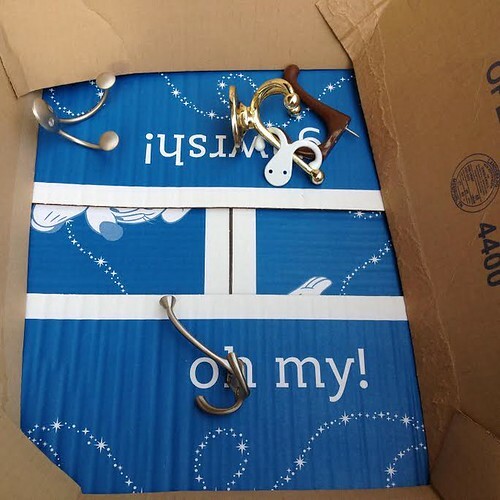 We dug out five old hooks of various colors and styles, and Mike spray painted them white. We have a number of home projects underway right now, and I tackled a couple of mini ones in some free moments this weekend. This first one I can hardly call a project, but it is a big improvement in my opinion. We moved our record wall from our old kitchen into the dining room of this house last year, complete with the three blank spots for seasonal changes. 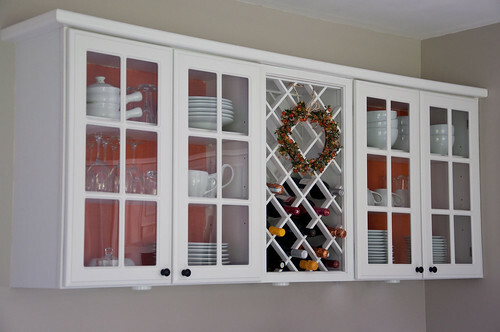 Hanging colored fabric in the back of cabinets with glass doors is a great way to add color to the room without the commitment of paint. 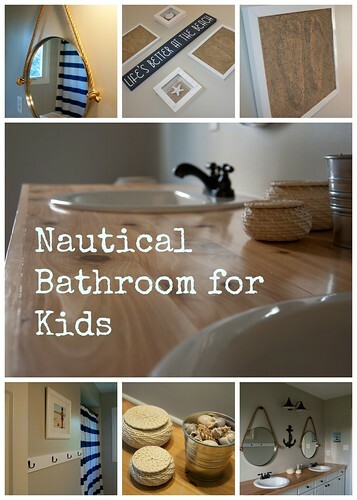 We just finished our kids' beach bathroom project, and I don't think I have ever loved a bathroom more! 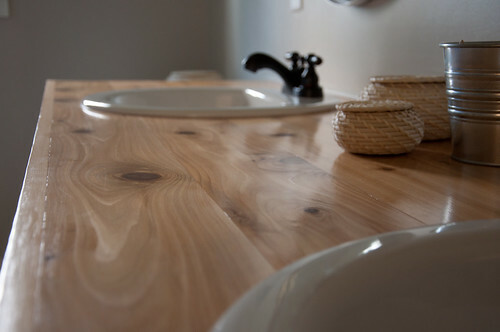 If I ever question my husband's amazingness, remind me of this countertop, will ya? So dang pretty! 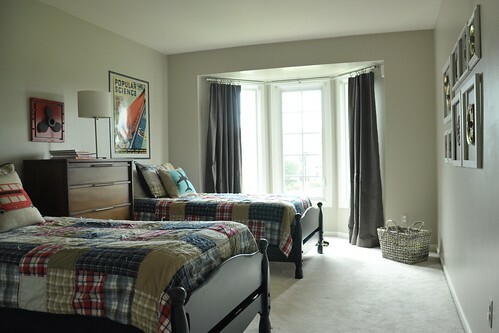 One great thing about taking our time to complete this room is that by the time we were ready to accessorize, I had all the ideas worked out and supplies ready come go time. 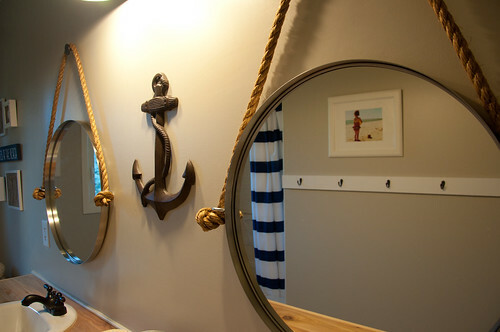 I've been dying to see these mirrors come together! My advice for these is buy extra plaster and frames in case your first attempt (or two) doesn't come out as nice as you hope. Aside from that, follow the tutorial exactly, and even watch the blogger's video on YouTube. That was super helpful for me. 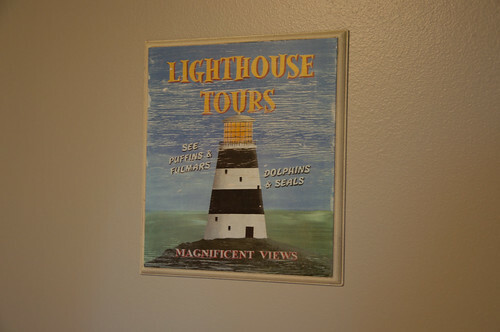 I bought the lighthouse at a thrift store on the same day that I bought the butterflies for Sophie's room way back when. 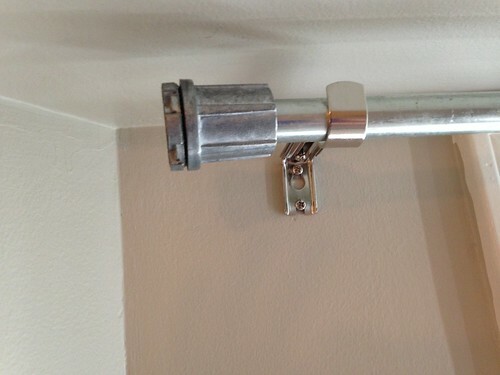 Mike made the towel rack with hooks and wood from Lowe's (based on my instructions...have to take a little credit). We are equally happy with the changes we did not make (and therefore saved money on). 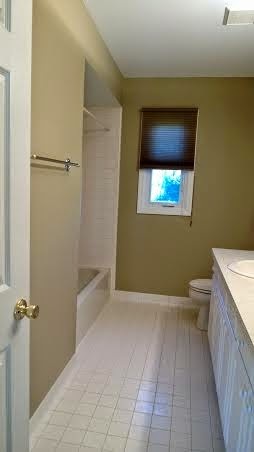 We chose not to replace the beige toilet, tile, and bathtub and also left the shower fixtures alone. 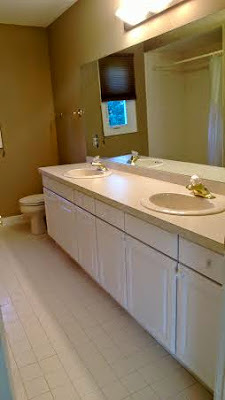 We also kept the bathroom vanity but never really considered tossing that. It's in good shape, and I like the white. 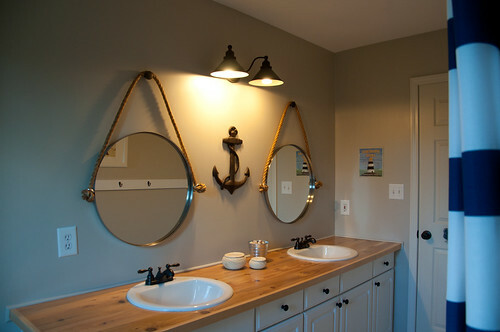 Maybe someday we'll do a full renovation, but for now, this fix-up is just what we imagined. 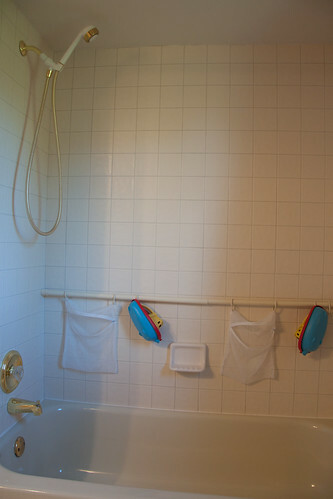 We even repurposed the old shower rod as a bath toy drying rod! 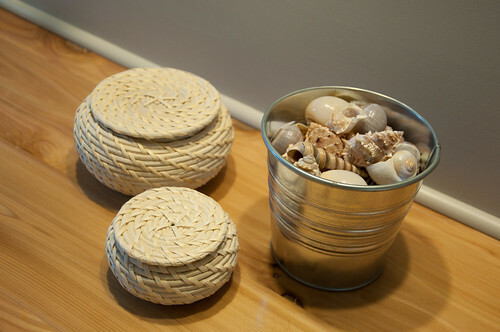 Take a look at some more DIY ideas at the Made by you Monday linky party at Skip to My Lou! It was roughly a year ago that we began working on Michael's room with Mike painting his old beds blue just before we moved into this house. With art on the walls and curtains on the window, I now feel satisfied calling this space complete. Although I've documented a number of steps toward completion over this year including the industrial gear gallery wall and $.89 poster frames, the final project was completing the curtain rod and curtains. 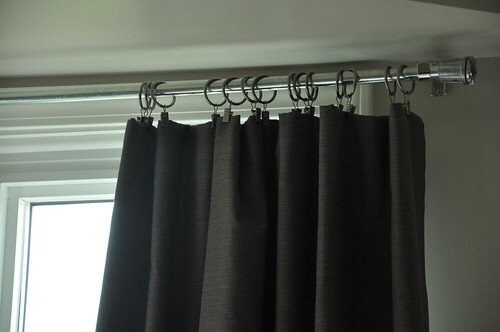 Using a length of electrical conduit, Mike made a curtain rod inspired by the DIY Bay Window Curtain Rod project at Here Comes the Sun. We used a cafe rod bracket set to hang the conduit after Mike bent it, and we attached fittings at the ends as industrial finials. We bought all of that at Lowes. I bought some actual blackout curtains for this room, but once they were up I found they were not as effective as the DIY blackout curtains in Sophie's room. I ended up doing the same project for this space using regular store bought curtains and blackout fabric again. 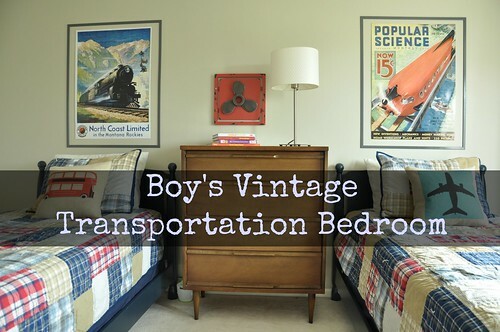 This room suits Michael's warm personality and classic interests in all things transportation. It is just what I envisioned for our guy! 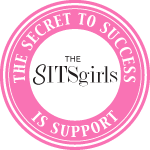 Check out earlier posts for more details on this space! 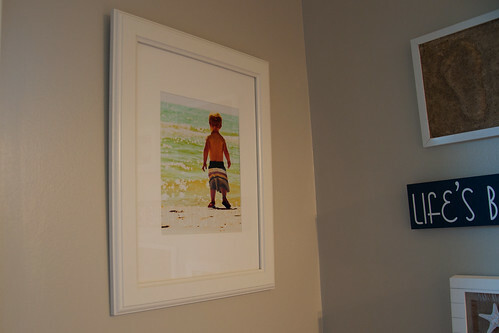 We created large frames for the posters in Michael's room using $.89 trim. 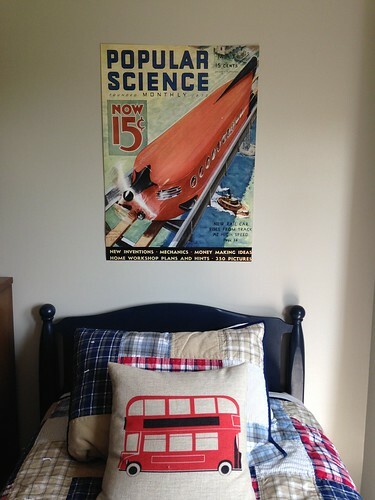 Earlier this summer I bought two vintage train posters for Michael's room from Cafe Press. I really wasn't sure how I would hang the posters when I bought them. For the sake of ease, and because they weren't very expensive, I bought poster frames from Target for $10 each, hung them up, and tolerantly hated them for a few days. The plexiglass reflected light in a weird, warpy way, and it just didn't look good. My next try was just hanging the posters right on the walls. This is a boy's bedroom after all. 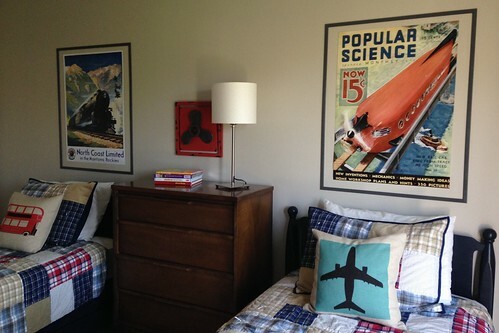 Posters stuck on the walls are kind of classic, right? Since I didn't want those oily, bumpy corners that sticky-tack left on the posters in my teenage bedroom I tried out mounting squares. The posters looked nice but still appeared unfinished on the walls without frames of any kind. 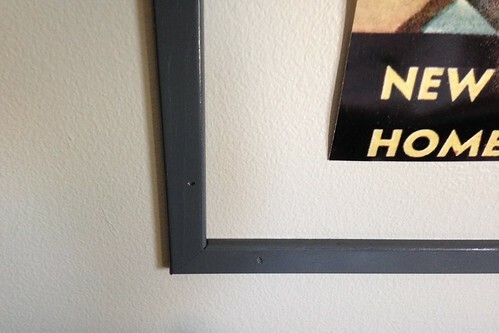 Ultimately, I requested that Mike cut some trim to make frames around the posters. 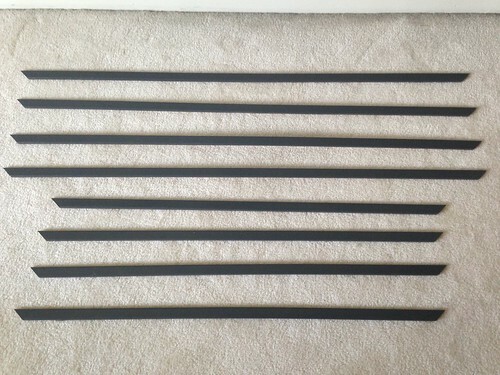 We picked out and bought some $.89 trim from Home Depot, Mike cut it into pieces with mitered corners, and I spray painted them dark gray to match the new curtains (more on those in a future post). For some help with cutting miters, here's a handy video from This Old House. 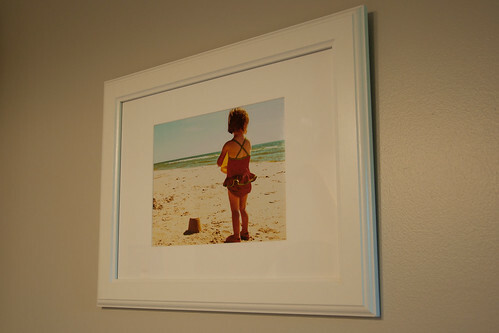 At first I hung the frame pieces using the same mounting squares (cut in half) to save on holes in the walls. That worked great on most pieces, but the trim was a tad warped and some sides would not lie flat against the wall without nails. 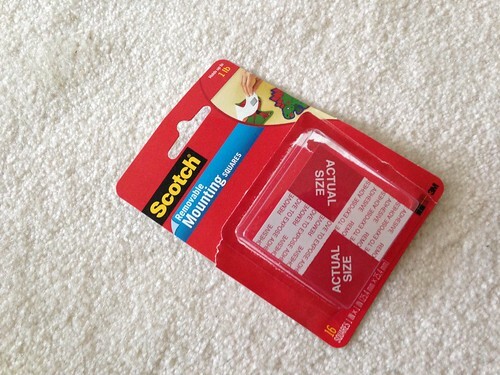 If you are sure to buy trim that is good and flat, mounting strips would probably work. 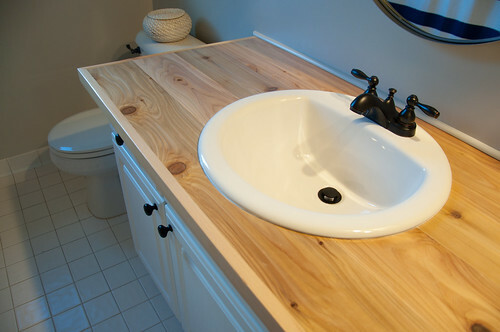 Since we did not, Mike used an air powered nailer to finish off the project. The end result is very pleasing to me. 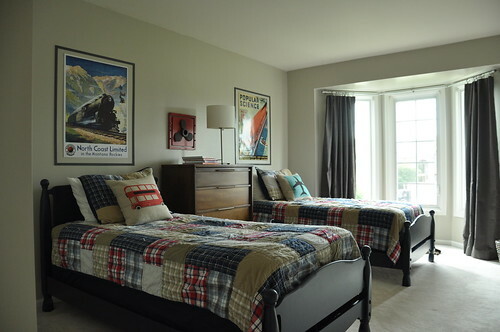 I love the delicate, architectural quality of the frames, the way they coordinate with the propeller over the dresser and the new curtains, and how they have a similar look as the gear wall. 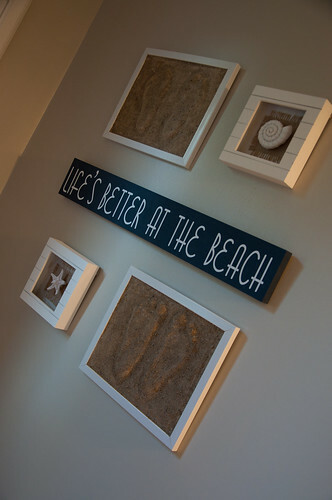 The poster frames we made from $.89 trim make me think this room is nearing completion! 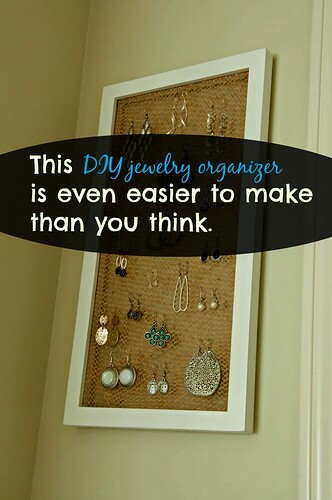 DIY Jewelry Organizer--Easier than you think! 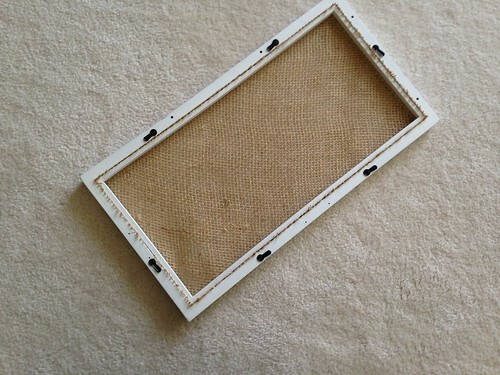 Creating an earring holder using burlap and a floating frame is ridiculously easy! When I decided long ago that I would make a picture frame earring holder like the gazillion I had seen on Pinterest, I shrugged to myself and thought, "I won't even blog about that one. 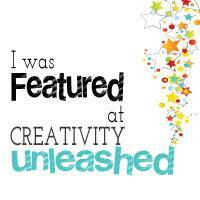 Everyone has seen that project already." Fast forward to a few days ago and now I'm thinking, "I must blog about this! The world needs to know!" Here's what you need to know. 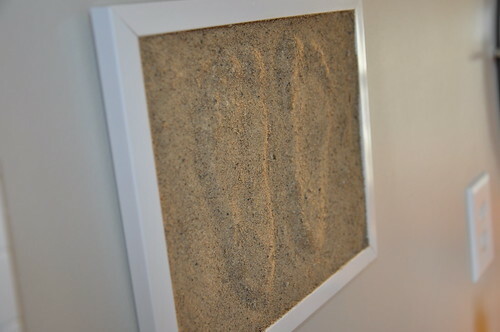 If you use a floating frame (you know, the kind with the two sheets of glass that you put your photo/document/postcards from your honeymoon in between), this project is ridiculously easy. I didn't have a tall and narrow frame that I envisioned for this project in my stash, so I hit Jo-Ann again and saw most frames were 40-50% off. I grabbed the one above because it was the size I wanted and intended to staple gun or glue gun or whatever gun some burlap or lace onto the back. The fact that this was a floating frame was just a little serendipity, I guess. To my delight, I found that this project with this kind of frame requires no craft weaponry at all--no glue guns, no staple guns, nuthin'. Watch this. Disassemble your frame into it's basic parts. 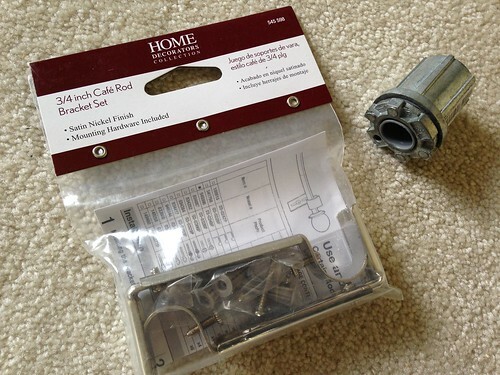 Set aside the glass and hardware, as all you need now are the frame and the smaller inner frame. 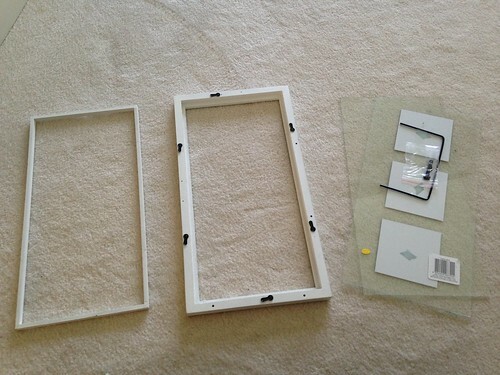 With the frame face down, lay the fabric of your choice over top. 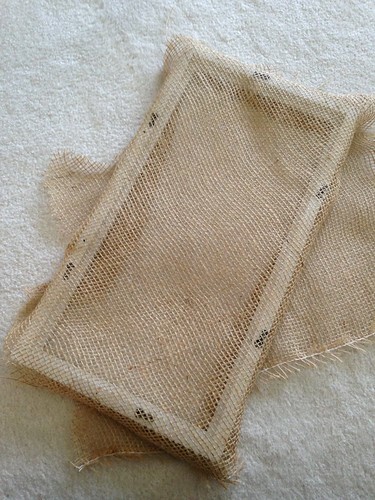 I used burlap from a hardware store, the really loose-weave kind, not the tighter stuff you find at fabric stores. 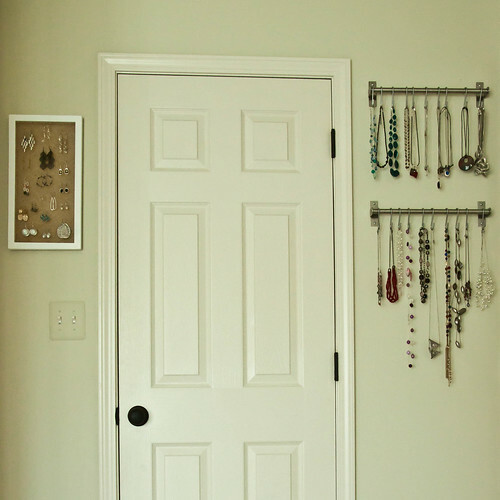 I thought this would work well for hanging earrings. I arranged it on an angle to make a diamond pattern with the weave just for fun. 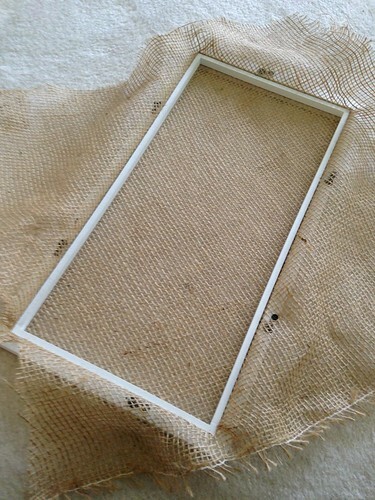 Fold the fabric under the edges of the frame a bit to provide a little tension and resistance for the next step. Push the inner frame on top of the fabric. Trim the edges, and guess what. You're done! That's it. 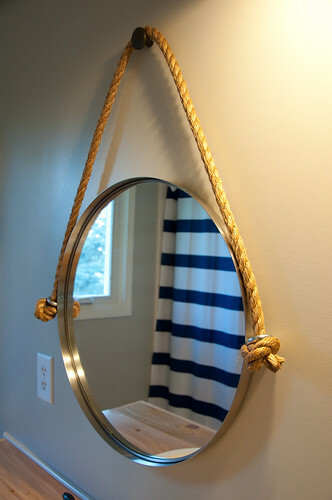 Hang your frame, hook your earrings, and there you have it. 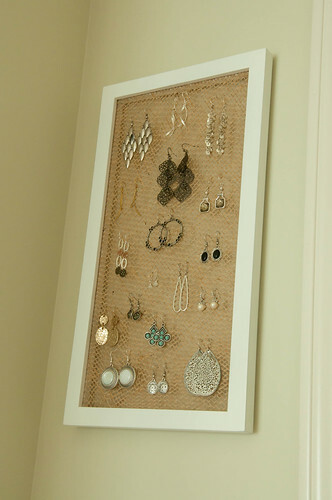 This earring holder made from burlap and a floating frame is the perfect complement to my Ikea rod and hook necklace hangers!